Whew! Just got back from playing ghost cat of Christmas present, well, if your reading this now then I am at the moment playing ghost cat of Christmas just past. Thomas Beckett, as always, your ghost cat on-the-prowl. Meowy Christmas! This year's human Christmas dinner was a small, cozy affair with only 18 people attending. I, of course, was on my best behavior, hower that can't be said of Ghost who snuck in and had to be booted out. 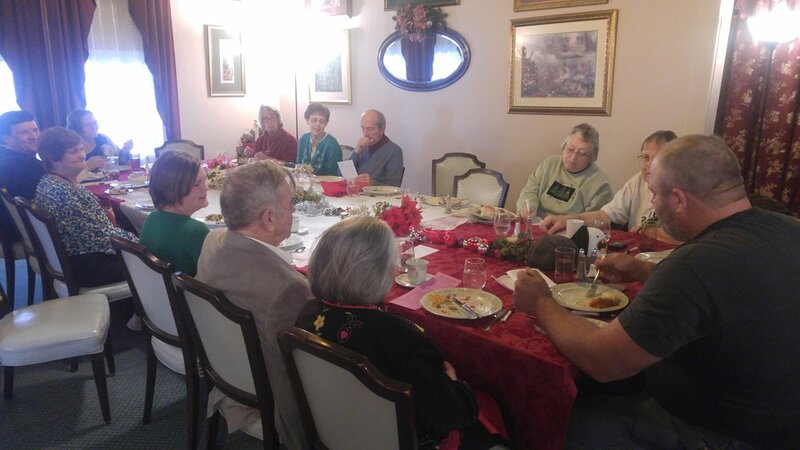 Along with the wonderful food (Kay's apple salad being quite a success), there was a Christmas quiz and musical stylings of Larry Murphy who sang a couple creatively funny new twists on some favorite classic Christmas songs. Celeste almost forgot to get up and take pictures. She knows I always like to have pictures with my comments. She did manage to get a picture of Roxanna and Kevin Wolfe who won the quiz game with 11 out of 15 right. Congradulations Roxanna and Kevin! Hey, do you know "what carol contains 'the everlasting light'?" Until next year, may your catnaps be long and fanciful & your catnip strong!